Cables are a popular choice of quilting design for borders and come in various widths and styles. Where would you start to plan a cable border for your latest quilt? Stencils are widely available, but they are often not the correct size for your borders- so unless you were incredibly organised, and designed your quilt to fit your stencil (and yes, I have done that – once! ), it’s really useful and satisfying to know how to draw it out yourself so that it will be exactly the right size for your project. It’s not as difficult as you might think. First measure the width of the border that you have stitched on. Subtract at least another ½”. 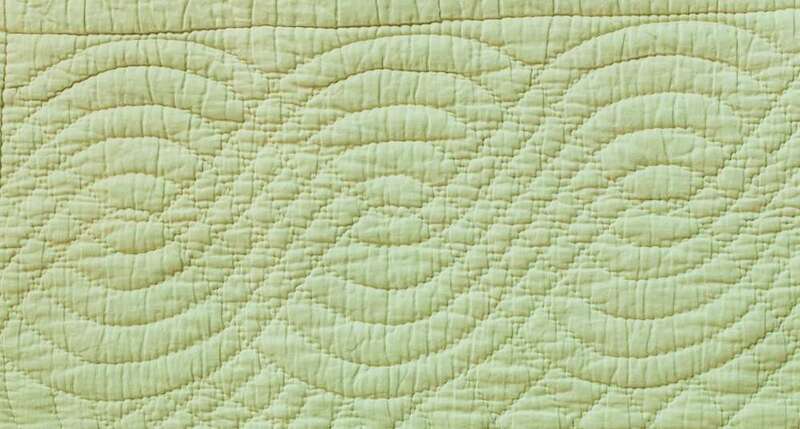 This will give a little “breathing space” around your quilting design on the inner and outer edge, and will avoid the need to quilt an area which has a seam allowance under it. The remaining measurement is your cable width. Now measure the length of the border without the border corner square (this is the Inner border length). Corners are worked out separately. You now need to find a suitable length for your cable so that a whole number fits into your Inner Border Length. 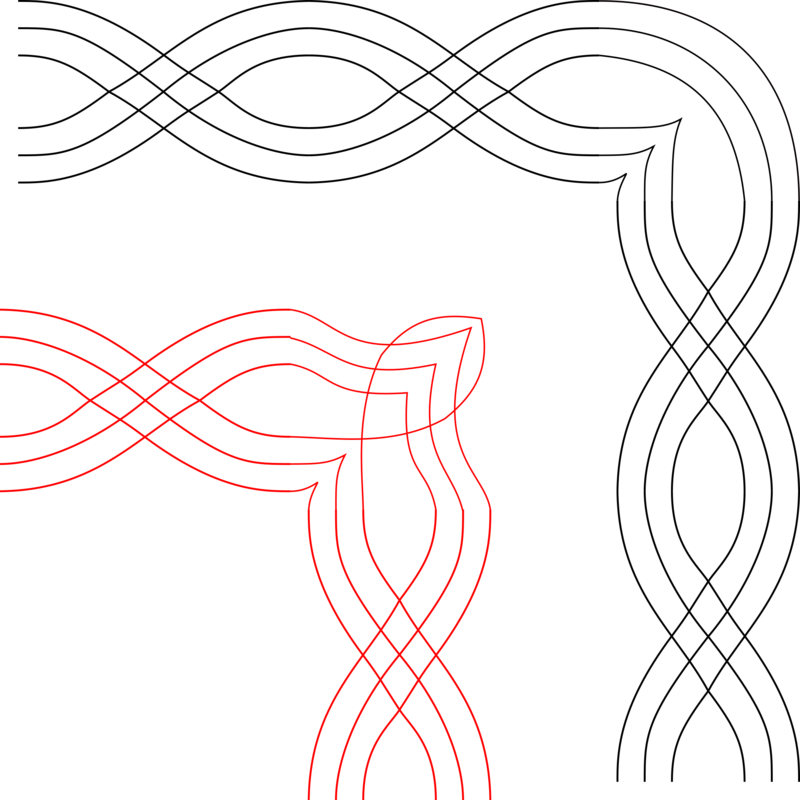 I have four cable repeats in the picture above – can you see that I am measuring from the middle of one oval to the middle of the next one – usually you will need the open part of the cable at the end (not, as is instinctive, the crossover part) to lead into the corner design. Working out the best cable length can either be done by maths, or by pleating a long strip of paper – more details are in the Drafting Cable Borders pack available in my Shop. Cable quilting designs can look very different, depending on your choice of shape and style. Look at the two cables below – both are the same length, and have the same number of strands, but because the first one is fatter compared to the length, it looks much more rounded. If you have a big quilt, you may have a choice between two or three options for your cable length – in a particular length and width of border, you could have a lot of short cables, which would look rounded, or a smaller number of more stretched out cables. Any ratio of cable width : cable length between 1 : 1 and 1 : 1.8 looks OK, but I think that about 1 : 1.4 gives the most pleasing proportions. I decided that this Cotton Reel Strips quilt would have two sizes of simple two strand cables; a smaller one for the sashing strips, and a larger one for the border. Can you see that the larger one is proportionately thinner (ratio 1: 1.8) than the smaller one (ratio 1:1.5)? The number of strands that you include can also change the appearance: These two cables below are exactly the same shape and size, but the second one has more strands. 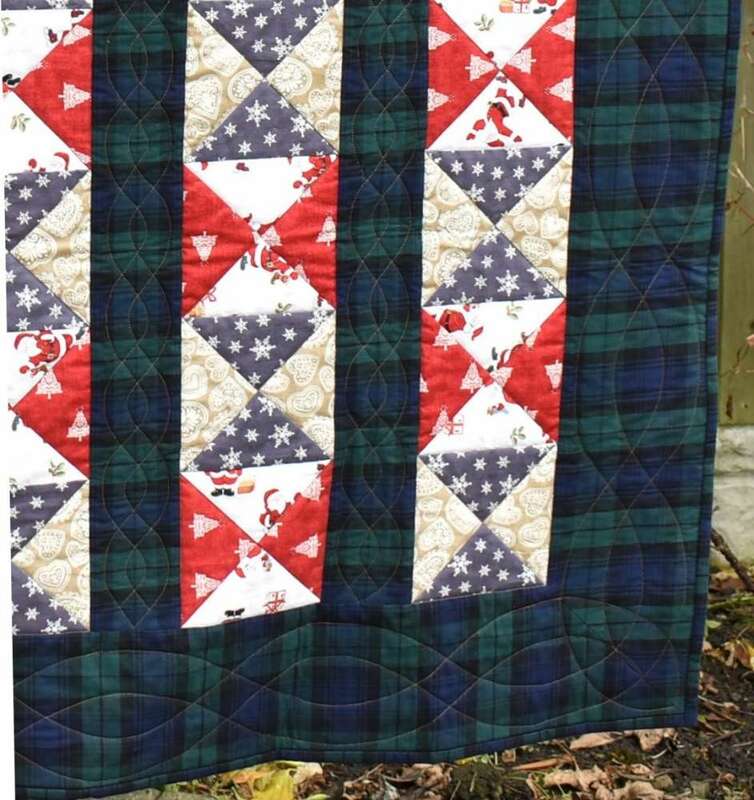 Several of my antique quilts have cable border designs – click on the links if you would like to see more photos of these. Once you have chosen the length and width of cable unit that will fit your borders, you need to draw it out. If you have a logical mind, you may be able to work it out from the diagram below. As with any new skill, there are of course a few hidden pitfalls which can make it tricky to get the cable design right. However, even if you don’t have a particularly mathematical brain, if the cable structure is broken down into a sequence of step-by-step instructions, drawing one section of a curve at a time, it makes the process much easier. I will be teaching this again at the Festival of Quilts in August 2019. If you would like to try this out by yourself, I have developed a set of written instructions which explain how to draw the cable onto a background grid, using reference marks to get the cable symmetrical and even. Reference marks are placed on the grid to keep the cable symmetrical. Each step is shown separately with detailed diagrams, and there are various options to explore which can change the style of the cable. For example, in the cable below, the lines don’t cross over, but twist like a rope. But how can you reliably get the size of cable you need for your quilt? 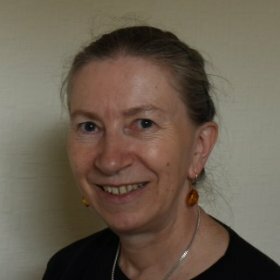 My special grid has been designed on the computer so that it can be stretched or squashed to whatever shape and size is needed. To get a fat cable or a thin cable, only the grid proportions are changed – the instructions are exactly the same. Look back at the fat and thin cable diagrams nearer the top of the page – can you see that the cable structure crosses the reference marks at the same places on the grid, but that sometimes the grid “squares” are not square? The complete technique pack for Drafting Cable Designs is available in my online Shop for £8. As well as step-by-step instructions for both styles of cable, and a variety of common sizes of grids to practice with, this pack includes access to a Microsoft Word file of the Mastergrid, so that you can then print out a grid of whatever size you need (sorry, no version yet available for Apple computers, but you could probably use a PC in a public library). The black corner is probably the most common, but the red one shows how you could have fun adapting this to make it more interesting. 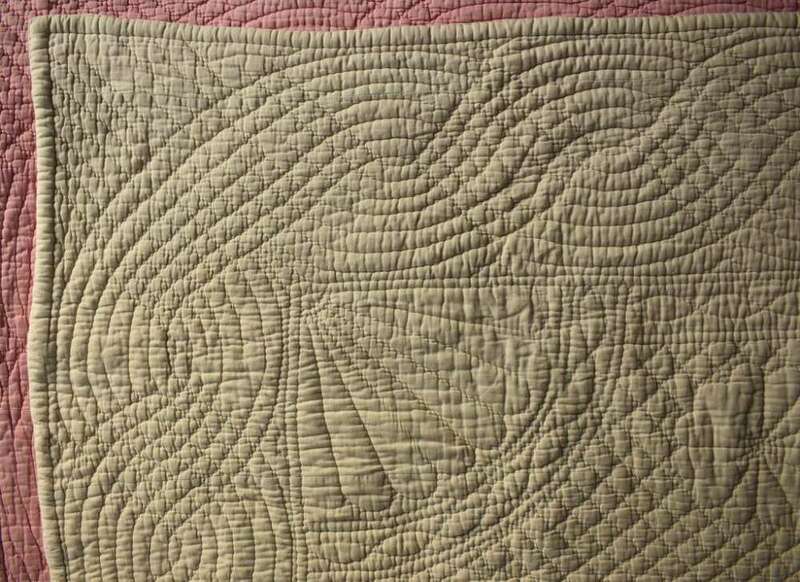 This quilt of mine (called The Burglar), was inspired by an antique Rob Peter to Pay Paul quilt, and has quilted tulips in the centre panel, so I designed a special tulip corner for the five-strand cable border. I have just bought this Cream & Pink Welsh wholecloth antique quilt simply because it has an unusual way of treating the cable at the corners. If you look closely, you will notice that her cables don’t reach the end of the inner border evenly – but this corner design allows a “fudge” to make it look fine! 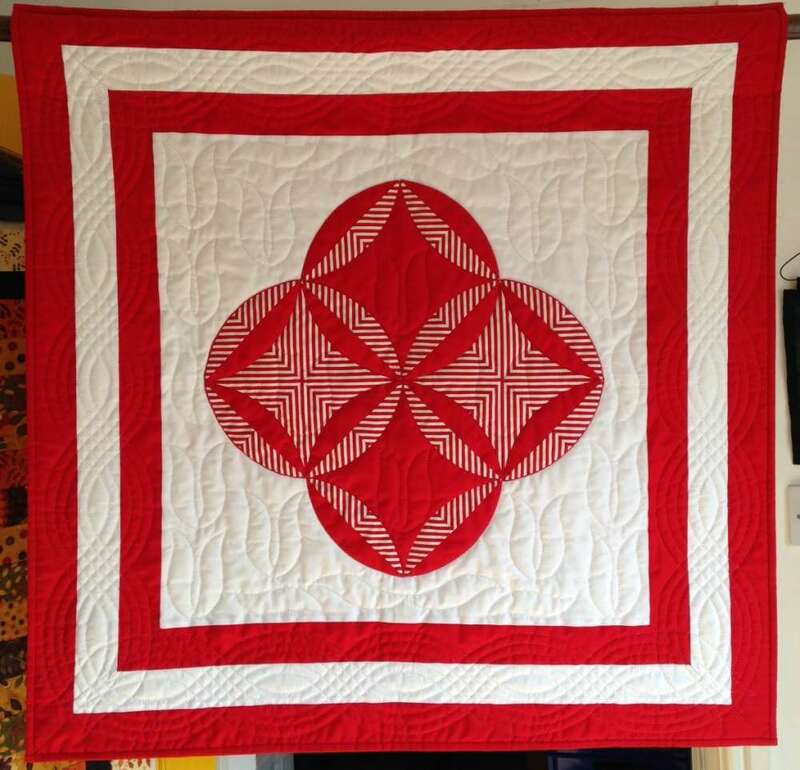 I have a particular interest in how quilting designs work at the corners – you can read more about it on a page about Border corners on wholecloth quilts in my website. If you have never tried to design any quilting pattern yourself, why not give cables a try? The Drafting Cable Borders pack could give you all the help that you need.